Abstract: The Upper Cretaceous was a time of global high stand of sea level and was the last time that the central North American continent experienced widespread marine deposition, with the Western Interior Seaway extending from the Gulf of Mexico to the Arctic Ocean. The marine deposits begin with the well-known near-shore Dakota Sandstone at about 100 Ma, extend through the Greenhorn Limestone, Niobrara Chalk, Pierre Shale, to the regressive Fox Hills Sandstone a few million years before the end-Cretaceous asteroid impact in the Yucatan at 66 Ma. These deposits are rich in fossil invertebrates (especially ammonites and inoceramid bivalves) that provide some the highest-resolved biostratigraphic zones in the world, in addition to significant marine vertebrates, and contain some of the most widespread organic-rich source rocks for world petroleum accumulations. Much of the ammonite biostratigraphy was developed by Bill Cobban, who worked on ammonite paleontology and biostratigraphy at the USGS for almost 70 years before his death in 2015. These widespread marine deposits are well exposed in the Colorado Plateau, Great Plains, and Northern Rockies and contain many volcanic ash deposits deposited in a marine environment, where they were altered to smectite clay-rich bentonite. Geochronologist John Obradovich, also of the USGS, worked closely with Cobban and published a several dozen 40Ar/39Ar bentonite ages to constrain the Cretaceous Timescale between 1993 and 2002. Since then, two major changes in Ar geochronlogy have taken place. The first has been a developing consensus, stimulated by Sam Bowring at MIT and the NSF-funded EarthTime project, to move the Ar monitor age from 28.02 Ma to the significantly older age of 28.201 Ma. Albian-Cenomanian Ar bentonite ages reported are shifted consistently 0.6-0.7 Ma older; however, this brings Ar ages into concordance with U/Pb zircon ages. Second, the increased sensitivity of the 5-collector Noblesse mass spectrometer at University of Wisconsin has reduced analytical uncertainties to ± 50 ky in most samples, allowing better correlation than ± 0.4 My uncertainty of Obradovich’s Cretaceous geochronology. Some examples of these new multicollector 40Ar/39Ar ages with 0.03-0.07% analytical uncertainties (average ± 50 ky) agree with tight stratigraphic stacking constraints. New ages include 97.52 Ma for the key Clayspur bentonite marker bed atop the Mowry Shale near Kaycee, Wyoming. Ages of 99.49 to 99.58 Ma were determined for Newcastle Sandstone from the NW Black Hills. Mid-Newcastle bentonite is indistinguishable from a 99.62 Ma age on lower Shell Creek Shale Member in the Wind River Basin. A lower middle Shell Creek bentonite from the Soap Creek Dome area, northern Bighorn Basin, south-central Montana is 100.07 Ma, very close to the Albian/Cenomanian boundary age of 100.2 Ma (new 28.201 Fish Canyon sanidine monitor age) determined by Obradovich and Matsumoto in Hokkaido, Japan. The age of the Newcastle is 1.6 My younger than 101.23 Ma Muddy Sandstone in the Wind River Basin. Uppermost Thermopolis Shale beneath the Muddy at Greybull, Wyoming is just slightly older at 101.36 Ma. In the Sweetgrass Arch area of northwest Montana, the 102.11 Ma Vaughan Member of the Blackleaf Formation is much (2.5 My) older than the Newcastle Sandstone, and yet a million years younger than Taft Hill Member at 103.36 Ma. Older ages for the Skull Creek Shale (104.87 Ma) in the Black Hills and 106.37 Ma on Thermopolis Shale in the Bighorn Basin are clearly distinct. Surprises in correlation revealed by these high-precision (<100 ky, part per thousand) 40Ar/39Ar ages place significant new constraints on paleogeography and sequence stratigraphic interpretation of these widespread and important petroleum source and reservoir sedimentary rocks. Bio: David Sawyer began his geologic career with the USGS in 1980 studying the deposits erupted in the 18 May Mt St Helens eruption. He got his BA at Colorado College, and his PhD from University of California, Santa Barbara studying the Cretaceous volcanic deposits containing the Silver Bell porphyry copper deposit near Tucson. During the first part of his USGS career he researched (mostly) old and cold volcanoes (in the San Juan Mountains, Colorado) and the geochronology, petrology, and geochemistry of the Miocene SW Nevada volcanic field regional hydrogeology in Nevada/ California Death Valley region. Later studies of the Rio Grande rift, New Mexico led to investigations of ammonite/ inoceramid biostratigraphy, bentonite geochronology, and regional stratigraphy of Cretaceous Western Interior Seaway deposits with Bill Cobban and John Obradovich. 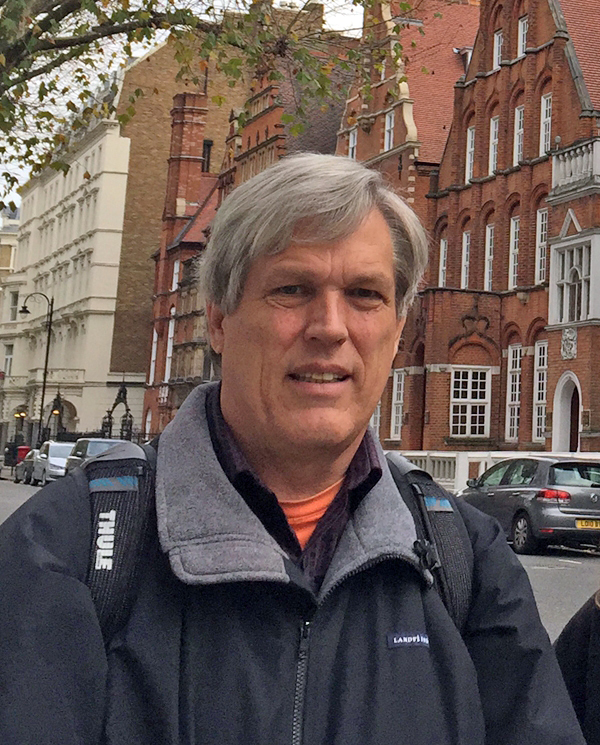 He retired from the USGS in 2014 is currently a research associate at the University of Colorado, Boulder, working with geochronologists from the University of Wisconsin and with the American Museum of Natural History.